RMS value of the sinusoidal waveform is measÂ­ured by the average reading voltmeter of which scale is calibrated in terms of rms value. This method is quite simple and less expensive. But sometimes rms value of the non-sinusoidal waveform is required to be measured. 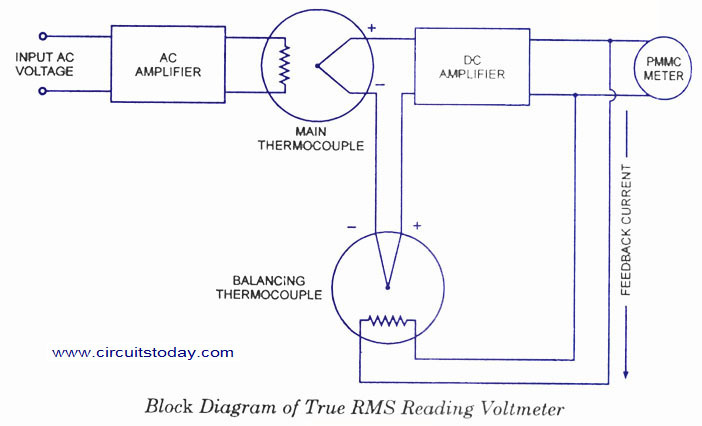 For such a measurement a true rms reading voltmeter is required.Â True rms reading voltmeter gives a meÂ­ter indication by sensÂ­ing heating power of waveform which is proportional to the square of the rms value of the voltage. Thermo-couple is used to measure the heating power of the input waveform of which heater is supÂ­plied by the amplified version of the input waveform. Output voltage of the thermoÂ­couple is proportional to the square of the rms value of the input waveform. One more thermo-couple, called the balancing thermo-couple, is used in the same thermal environment in order to overcome the difficulty arising out of non-linear behaviour of the thermo-couple. Non-linearity of the input circuit thermo-couple is cancelled by the similar non-linear effects of the balancing thermo-couple. These thermo-couples form part of a bridge in the input circuit of a dc amplifier, as shown in block diagram. 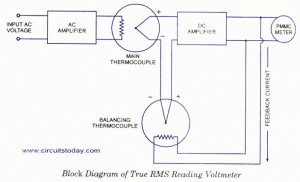 AC waveform to be measured is applied to the heating element of the main thermoÂ­couple through an ac amplifier. Under absence of any input waveform, output of both thermo-couples are equal so error signal, which is input to dc amplifier, is zero and therefore indicating meter connected to the output of dc amplifier reads zero. But on the application of input waveform, output of main thermo-couple upsets the balance and an error signal is produced, which gets amplified by the dc amplifier and fedback to the heating element of the balancing thermo-couple. This feedback current reduces the value of error signal and ultimately makes it zero to obtain the balanced bridge condition. In this balanced condition, feedback current supplied by the dc amplifier to the heating element of the balance thermo-couple is equal to the ac current flowing in the heating element of main thermo-couple. Hence this direct current is directly proportional to the rms value of the input ac voltage and is indicated by the meter connected in the output of the dc amplifier. The PMMCÂ Â meter may be calibrated to read the rms voltage directly. By this method, rms value of any voltage waveform can be measured provided that the peak excursions of the waveform do not exceed the dynamic range of the ac amplifier. explaination is good ,satisfy with it…..